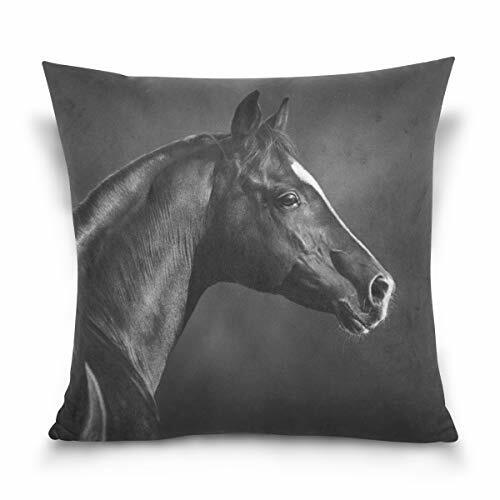 Holisaky Portrait Black Arabian Horse Decorative Square Throw Pillow Covers Cases Home Décor Bed Sofa Couch Car 16 x 16 inch by Holisaky at Al Dammam City. MPN: bz-m01. Hurry! Limited time offer. Offer valid only while supplies last. Size: 16 x 16 inch, Double-sided printing. Made of Polyester and Cotton Blend. EASY INSERTION: We use matching shade invisible zipper closure for an elegant look, easy insertion and washing. Please note this listing is for pillow cases Only, pillow inserts are not included. If you have any questions about this product by Holisaky, contact us by completing and submitting the form below. If you are looking for a specif part number, please include it with your message. Designart CU13288-12-20 Gray Arabian Horse Watercolor' Abstract Throw Lumbar Cushion Pillow Cover for Living Room, Sofa, 12" x 20"
Designart CU6469-26-26 Arabian Horse in Desert Storm' Photography Throw Cushion Pillow Cover for Living Room, Sofa, 26 in. x 26 in.